Die Britischen Inseln bis auf Wilhelm den Eroberer 1066. 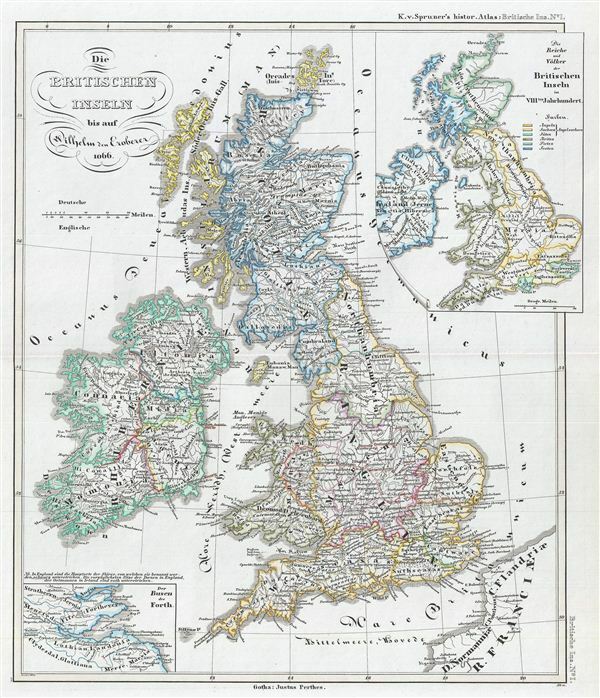 This is Karl von Spruner's 1854 historical map of the British Isles shortly following the 1066 invasion of William the Conqueror. The map covers from the Orkney Islands to Cornwall, including Ireland. Two inset maps on the top right and bottom left corners detail the Kingdoms and the Peoples of the British Isles in the 18th century. On September 28, 1066, William, Duke of Normandy, invaded england, thus marking the beginning of the Norman conquest of england. Following his victory over King Harold II of england at the Battle of Hastings, he became known as 'William the Conqueror.' The whole is rendered in finely engraved detail exhibiting throughout the fine craftsmanship of the Perthes firm. Prepared by Karl Spruner for publication as plate B I in the second edition of Justus Perthes' 1854 Historich-Geographischer, Hand-Atlas zur Geschichte der Staaten europa's vom Anfang des Mittelalters bis auf die Neueste Zeit.